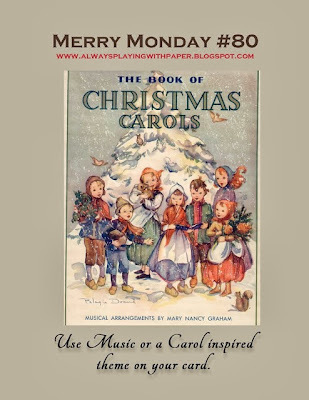 Karen Creates Cards: The Merry Monday Christmas Card Challenge # 80 - Music or Carol Inspired theme. The Merry Monday Christmas Card Challenge # 80 - Music or Carol Inspired theme. Merry Mondayers created a bumper crop of gorgeous Snowflake cards (also a bag and an ornament) last week. It was so hard to pick just one favorite when all were worthy. Such talented challenge participants. This week's Merry Monday Challenge is a music inspired theme. Soon we will be singing carols to celebrate the season. Here's a chance to feature your favorite carol or music on a card, or perhaps just a music themed paper. I don't have carol or music stamps but my little Inkadinkadoo snowman stamp brought to mind that wonderful song, 'Let it snow, let it snow, let it snow'. He really seems to be celebrating just that thought. I hummed and hawed about using Kraft as a card base but I liked the look so went ahead. I used one of my favorite embossing folders to emboss it. For the tag base I printed off the words to the song. You can just see the first verse at the top. The sentiment is also printed. The scallop die cut is actually a greeny/grey but the photo is showing just grey. Stamps: Inkadinkadoo Snowman. Printed Sentiment and tag base. Card: Bazzill Kraft, Neenah White, MME Paper. Well that's it from me for this week. Go to Lesley's Always Playing with Paper to see the cards from the other design team members. Very cute...I love that you printed your own lyrics for the paper! Adorable! How clever to print the words to the song on the tag, Karen! And that snowman does look like he could be singing that song! Love it! Great card, Karen. I've said it before but I love how you combine different elements onto your cards. The printed tag is genius! What a great card and I love how you printed the words on your tag...cute!!! Awesome! What an adorable card Karen, your snowman is so cute and I love the tag with snipit of a carole. Nice idea to print the song on your tag Karen. I love the snowman image, you have created a very festive card. What a fun card, Karen! I love everything about it: the craft base, the tag, the cute snowman and your fun embelishments! I LOVE every thing about your card. The colors, the embossing, stamp set and embellishments!